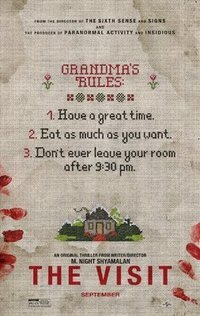 The Visit is writer/director M. Night Shyamalan’s lukewarm resurgence, delivering his inevitable twist in a mediocre casing rather than an offensively schlocky shell. The twist is actually one of Shyamalan’s better turns, allowing for subtle story hints throughout that pay off in an excellent reveal. Unfortunately, the repercussions from the twist aren’t nearly as satisfying as the event itself. The characters and the rest of the hokey plot conjured up to house the twist (involving the grandchildren shooting a documentary about their grandparents on a visit and attempting to get them to forgive their mother for marrying an older man…I know) range from innocuously time-wasting to unbearable. Newcomer Olivia DeJonge holds her own despite asinine dialogue and being cast as the kind of precocious teen (Becca) that can only be written by middle-aged filmmakers. She’s obsessed with movie-making and uses Intro to Film 101 terminology like she’s reading it off a teleprompter, but her transitions from disgust to fear to earnest intrigue feel genuine. She’s got chops, especially for the horror genre. The grandparents are played by Peter McRobbie and Deanna Dunagan, seasoned character actors that deserve the spotlight. Both put it all out there, giving wonderfully warm and foreboding performances. Each actor can change the mood of a shot by adjusting their physical presence, no words necessary. Kathryn Hahn, as the children’s mother, delivers a wonderfully emotional performance mostly delivered speaking directly into Skype or the camera. That’s hard to nail when you’re not interacting with other people, and she aces it. So, about those worthless characters. Becca’s little brother Tyler, played by Ed Oxenbould, is a thirteen-year old aspiring freestyle rapper that punctuates the ends of each of his (THREE) torturous freestyle segments with a “ho”. So he’s about as endearing as your average misogynist white thirteen-year old rapper. This is supposed to be a main character that we DON’T want to die. Instead we get a wooden sub-Bieber who’s more existentially terrifying than the jump scares. The children’s characters have no depth or humanity, functioning as mobile lists of traits. We hear “You are such-and-such way” or “have this problem and cope like this” time and time again, only for these character moments to either never pay off, or be barely exploited to justify a small scene. They never feel integrated with the characters that allegedly possess them, rather like tics on a checklist. And it’s too bad, because these annoying kids really needed something in their corner to make the audience not beg for their death. The emotional subplot (let’s get Pop-Pop and Granny to forgive our mom) goes nowhere and does nothing. Like the Lifetime-style commentary on abuse tacked onto Sinister 2, this odd and misguided attempt at drama has no place in the cheap thrills of this movie. As for the thrills, they’re few and far between. As you’ve inevitably seen in the previews, there’s something amiss with these two elderly people. You know what that means: Grandma skitters around on the floor in a trance, or sightlessly bangs doors in the middle of the night. Grandpa just seems forgetful, but maybe he has a dark secret. There’s nothing unexpected or powerful in play here, any success coming from the prowess of the actors involved. The shaky, found-footage look justified by the documentary subplot is hard to watch and serves no purpose. Nothing is made scarier – in fact, often the cinematography made things far less frightening since we either couldn’t see ominous signs clearly or a moment of quiet dread was interrupted with wobbly camera movement. It also pried attention away from the scares and onto the camera itself, ripping us out of the movie’s fiction. Random shots of the exterior and the environment render even the YouTube vlog-style inconsistent. There is so little to say about this movie. I can easily see how M. Night got people behind him when he told them the premise and the twist. It’s solid, and I wish he had sold the idea to someone with some artistic vision. Instead we get what we always get with Shyamalan movies, from Devil to The Village to The Happening: a movie formed around a twist. This time we don’t get drivel, which is always nice, instead getting bland mediocrity. From a career perspective, this is a huge boon for Shyamalan. From a moviegoer perspective, most horror films are on the wrong side of mediocrity to begin with. But that doesn’t mean we shouldn’t ask for more. The Guest, The Conjuring, The Babadook. It Follows, Ex Machina, Unfriended. These movies were shocking and scary and had something to say. They frightened us because they spoke to us. The Visit, at best, will be one of those movies uninteresting enough that the teens seeing it won’t be distracted from thinking about whether or not their date will hold their hand.